I get asked often to recommend an Indian restaurant. I can only assume the significant choice means that people are keen to know they are travelling to the best one. The battle to visit the key players in Nottingham isn’t clue to being over, despite trips to; Memsaab, Curry Lounge, Haveli, Kayal, Singh’s, Calcutta Club. There are more I have visited off-blog and not in the city-centre, but for me the cooking is stronger centrally. Correct me if I am wrong of course. Probably my most visited location for Indian food last year was Cumin, but I never wrote a review. A little surprising but I see that as a compliment. I always want to go to visit, I never think that I should, or need, to go. And why do I so often return? I don’t have to think to hard about the answer to that question, a Tandoori Mixed Grill. It doesn’t seem cheap at £15.95 for a large to share but you won’t be disappointed. Quite apart from the prodigious size there’s a pretty good diversity of elements. A seekh kebab is a solid, functional filler if lacking a little excitement. Marinated, fat prawns are well fragranced and remain juicy. A couple of pieces of chicken are also good, retaining their moisture, well spiced and different enough to have the 2 variations. The final lamb chops will have you gnawing at the bone, hunting down the last vestiges of meat. Tempted as I might be to follow the shared mixed grill with a mixed grill of my own as a main course I’ve never had the cojones. Besides it wouldn’t make for the most interesting review. 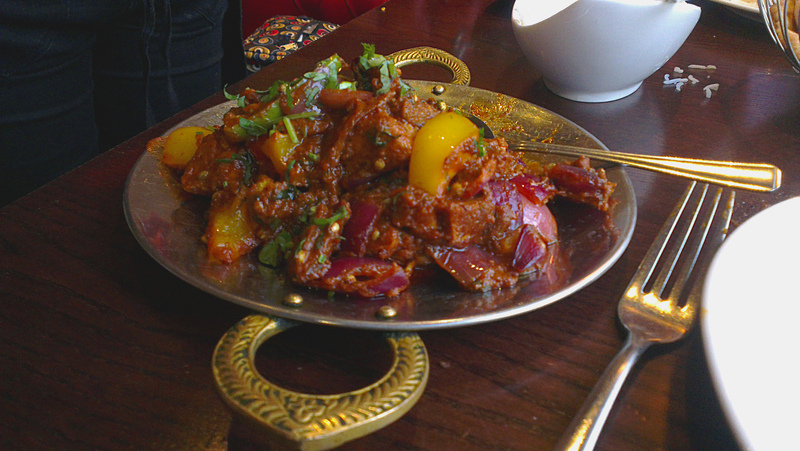 I err toward a tomato-y base rather than creamy so a murg shilma mirch (£10.95) fitted the bill nicely. A distinct warm and richness of sauce broken up nicely by the peppers and well cooked chicken making for a satisfying main dish. Service is solid with one of the two brother owners ever-present. Things could be sped up a few minutes to receive courses but it’s a small blot on the copy book. Cumin isn’t trying to be posher like Memsaab and doesn’t offer that something different like Kayal but in my many visits I can scarcely think of a complaint or criticism about the food. Have you tried desi downtown? Worth a try, good curry and very reasonable! I’ve just read a few of your Nottingham curry reviews and opted for this one for a team night out from my workplace. You’re doing great business for everyone! Thanks for taking the time to review.